Any explorer of the past would certainly like to know each and every detail of the history of the "flagship" archaeological sites. The legendary earthwork castle of Cherven is one of such sites. It is believed to have been the capital of Red Ruthenia, whose end came in 1261, as khan Burondai ordered castle fortifications demolished. However, we are often prevented by funds and technological constraints from exploring such a big archaeological complex as Cherven, which spreads over an area of several dozen hectares. That is when appropriate aerial surveys come in useful. Owing to several environmental factors overlapping(such as a high groundwater level, low cut grass, vegetation not yet in leaf), numerous construction elements of old Cherven, which is believed to have been the biggest fortified settlement in Red Ruthenia, could be seen from above. During his spring pass, the author located traces of the moat, traces of buildings in the castle yard, some traces and the layout of the suburban buildings, a harbour, a former river bed, road traces, the site of former archaeological excavations, and minor unidentified sites. The author made a preliminary attempt at interpreting the traces as the site is still waiting to see its first dedicated comprehensive written study. The moat was spotted first during the pass. Archaeologists who explored the site believed this element of the defence system of the earthwork castle had never have existed (K. Jażdżewski, p. 72). However, the facts turned out otherwise. The moat surrounded the whole castle and was approximately 6-8 m wide. It can best be seen in the east section as it had been set by the early medieval builders at a considerable distance from the earthworks so it was not buried as they inevitably eroded. The other parts of the moat have been buried under soil and sand sliding down the outer layer of the earthwork structure. As it can be seen, the moat was an element in the inner defence system of the castle. 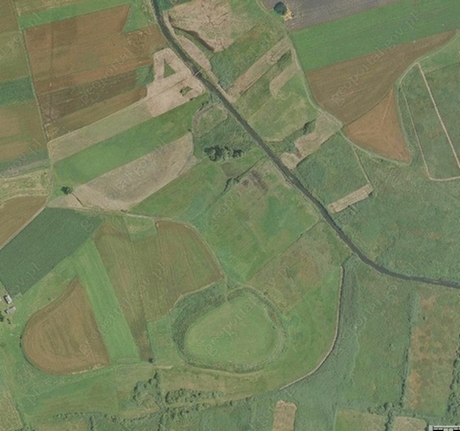 The first line of defence, besides the natural wetlands as well as the Huczwa and the Sieniucha rivers, consisted of water reservoirs formed by turf extraction (turf is believed by the author to have been the primary earthwork building material – to be discussed below). Excavations did not yield much information on the buildings inside the castle or their layout. Aerial photographs taken at the right time allowed several structures to be located. Structure 1 became apparent in the north-west section of the castle. The shorter side of the building traces faces north. Are those the traces of a medieval temple, a nobleman’s house or another type of building? An answer will only be known after thorough excavations. Worth noting is the fact that "... in the north-east section, not far from the supposed gate, the remains of a brick foundation were discovered upon clamping potatoes, at a depth of approximately 40-50 cm ..." (Jażdżewski, p. 72). These words from Professor Konrad Jażdżewski’s article to some extent confirm the author’s sky-high findings. In the central section, Structure 2 was visible, with a centric shape and quite a substantial diameter. That may be a trace of the major building. A local tale has it that a well had once stood there. Two other oblong rectangular structures can also be seen. Those are traces of archaeological excavations while the black belts are places where hay was burnt. There are several suburban settlements in the Cherven complex but not all of them bear any evident traces of former buildings. It was only in the westernmost settlement, which has the shape of an oblong promontory, that numerous terraced buildings were discovered. The buildings were quite big in size, which can be judged by the tractor wheel marks in the ground. A wooden barn standing nearby (bottom right-hand corner)can also serve an ad hoc comparison. A total of approximately 15 big structures can be seen. There must be many more but unfortunately the traces of some of those have blended to form bigger stains without clear borders. The harbour was an oblong rectangular element in the structure of old Cherven, situated just across the moat on the east side. The harbour was cut off from the main bed of the Huczwa river by a long, narrow promontory, and separated from the moat and the earthworks by a dike, a sort of earthen embankment. Extraction of building material (turf) created a place where boats and rafts could be moored safely. Why the assumption it was a harbour? The bed of the Huczwa river, once unimproved, used to be much wider. It is quite well visible in one of the photographs. That made travel and transportation of goods easy for people in the Early Middle Ages. One could float down the Huczwa river from Cherven (Czermno) to Volhynia (Gródek), then down the Bug to Ustyluh, Horodło or even further down to Chełm. The people who resided in Cherven at the time must have taken advantage of such great transport opportunities as were offered by rivers. What were the earthworks made of? The answer to this question lies in the construction of the moat, the harbour and other dug-out structures. Once again quoting the words written in his article by Professor Konrad Jażdżewski: "... the outer part of the earthwork in the east section of the castle was levelled down at a length of approximately 30 m. On that occasion, the people who participated in the levelling noticed that the earthwork base had supposedly been made of turf ...", we can be reassured that the principal building material was turf, as was already mentioned above. That was and still is the most abundant building material in the neighbourhood (K. Jażdżewski, p. 72). In the photographs, a ditch is also visible at the base of the outer part of the earthwork. It can best be seen from the east. That is another element of the defence system of the early medieval castle to have been located during a single flight. The roads must have been connected with dikes, which formed as if their extensions. Archaeological excavations were conducted in the Cherven complex already in the 19th century. The plans of the old excavations are largely unknown. However, during his flight, the author noticed several archaeological digs. The most obvious of those is to be found outside the earthwork in the east section of the castle. The outer edge of the dig can be seen, which did not reach as far as the moat, as well as traces of dug-out earth deposits. Structures of this type must be carefully verified against any preserved plans as they may be mistaken for ancient structures. The unique environmental conditions made it possible to notice both ancient building elements and subsequent human activity traces. Previous knowledge of the "capital" of Red Ruthenia was thus reviewed to a large extent. The results of the present aerial survey may considerably simplify any further research activities in Cherven. The author’s aerial findings can only be verified against proper excavations. The flights also reveal the need to have archaeological sites documented from the air on an ongoing and, most importantly, frequent basis. Such amazing traces as in Cherven can only be discovered by more frequent flights. Any archaeological site has its own whims and will only sometimes reveal its secrets to us. Copyright Marek Poznański 2007-2019. All right reserved!